The Stacker Double Glazed door will offer you maximum glassed area to take advantage of any views or outside entertaining area. The Double Glazed Stacker door is essentially a sliding door, where each of the panels in the stacking unit with 3 to 5 sections, all collected on either right or left hand side. Many clients and specifiers use them as an alternative to sliding doors to create depth and space because all door movement is contained within the frame. 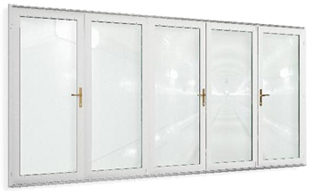 Sliding Double Glazed doors are available in 2, 3 or 4 sections or panels. Both Stacker and Sliding Doors can be designed so slide into a wall cavity, for an ingenious space solution with unlimited potential. You've spent time & energy to build an exquisite home - don't cheapen it with mediocre aluminium windows and doors, but enhance it with the perfect finishing touch: custom made Double Glazed Stacker door that radiates style and efficiency. We are able to accommodate a variety of architectural styles with state of the art technology to manufacture the ideal doors that will compliment your home. After many years of constant improvements, we have designed a hardware system, which not only adds value through quality to your doors and your home but also alleviates the frustration of doors that jam or become difficult to open. Engages at 2 x 90o intervals, are ideal for use with sliding opening door systems. Cylinder comes with the key. Prevent shashes from slaming the against the frame. Double Glazed Windows and Doors sliding doors are fitted with adjustable, long-lasting rollers that glide smoothly on specialised tracks. We believe that quality hardware makes all the difference for smooth operation for years to come. Cylinder is accordance with EN 1303. Exterior door furniture to suit multipoint locks. The sprung levers are fixed to the backplate and by design are fully reversible. Fixing lugs are present on both backplates for a positive location. Operational tests are carried out on the handles on the stacker doors itself. This means that, not just the function, but also the durability of the attachment between hardware and window is tested thoroughly. They are given the equivalent of 50 operational cycles a day over a period of 10 years. Neither the stacker doors handle itself, or any part of it, must become loose during the course of the test. This ensures the components Double Glazed Windows and Doors use perform consistenly well, so that our customers enjoy a trouble free use of their windows!